Providing communication equipment to the affected municipalities. Satellite communication vehicles substituted for completely cut communication systems of the affected municipalities. The communication system, a lifeline for the disaster-affected people, had been completely disrupted. Some municipalities, having had damage to their municipal office, such as Minamisanriku in Miyagi Prefecture, even lost their administrative function. From the second day following the disaster, the MLIT began mobilizing the disaster response vehicles called in from the Regional Bureaus all over Japan, and sent them to 16 municipalities by the fourth day. 192 disaster response vehicles were mobilized on April 15 at the peak. The vehicles secured the communication system connecting with all the affected municipalities, allowing their voices to be heard: for instance, about the magnitude of damage in details, what kind of relief supplies they really needed, etc. This eventually led to increasing support to the disaster-affected people. In order to support various activities toward restoration, total 192 disaster response vehicles so far have been dispatched to 27 municipalities (17 cities, 8 towns, and 2 villages) in 3 prefectures, in cooperation with the Regional Bureaus all over Japan. The dispatched disaster response vehicles include pumper trucks, lighting vehicles, mobile command vehicles, standby support vehicles, satellite communication vehicles, and Ku-SAT. A mobile command vehicle provides a working space for information gathering, commanding, evaluating the strategy, and communicating with other organizations as response headquarters on site of the disaster. In the Great East Japan Earthquake, the vehicles were dispatched to the affected areas and were substituted for the municipal offices whose functions were lost in the disaster, such as the city office of Rikuzentakata, which was swept away by the tsunami. A satellite communication vehicle provides an alternative communication channel when conventional terrestrial telecommunication lines (the network of NTT and mobile phone) are disrupted in disaster or when people need to establish a communication channel with a site of disaster, using communication satellites. People can use this alternative channel at the site of disaster to inform the magnitude of damage, etc. In the Great East Japan Earthquake, the satellite communication vehicles were provided for the municipalities whose communication systems were disrupted by the damage caused to the base telecommunication network stations of NTT or mobile phone companies. The device secured temporary telecommunication lines for the affected municipalities. A Ku band satellite dish (small satellite image transfer device) helps distribute images and voice at the same time using satellite communication. Its small size and light weight make it portable. In the Great East Japan Earthquake, the Ku band satellite dishes were provided for the municipalities whose communication systems were disrupted by the damage caused to the base telecommunication network stations of NTT or mobile phone companies. The device secured temporary telecommunication lines for the affected municipalities. A satellite mobile phone provides an alternative communication channel when conventional terrestrial telecommunication lines (the network of NTT and mobile phone) are disrupted in disaster or when people need to establish a communication channel with a site of disaster, using communication satellites. People can use this alternative channel at the site of disaster to inform the magnitude of damage, etc. In the Great East Japan Earthquake, the satellite mobile phones were provided for the municipalities whose communication systems were disrupted by the damage caused to the base telecommunication network stations of NTT or mobile phone companies. The device secured temporary telecommunication lines for the affected municipalities. A pumper truck drains water fast and effectively from flooded areas primarily in a scene of disaster, such as storms. Extensive area of Sendai Airport was flooded in the Great East Japan Earthquake, and a fleet of pumper trucks were engaged in drainage for 24 hours. Drainage was performed in the areas flooded by the tsunami to search for the missing underwater. A lighting vehicle provides lighting for works in the night at site of disaster. In the Great East Japan Earthquake, the vehicle provided lighting for the disaster restoration works, evacuee support, and search for the missing in the night. 130 out of 190 vehicles were reinforcements called in from the Regional Bureaus all over Japan. 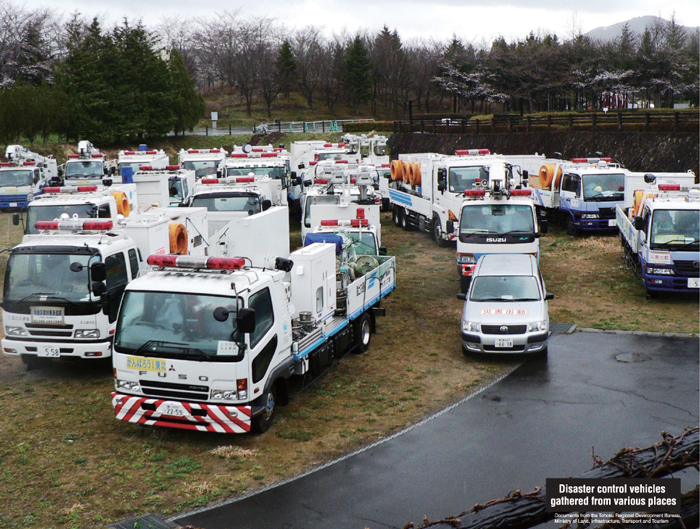 13 disaster response vehicles, mainly sprinkler trucks, were dispatched to the Fukushima Daiichi Nuclear Power Plant as reinforcements (operated under the command of TEPCO).